I am pleased to welcome writer, educator, and independent filmmaker Arthur Hoyle. His documentary films have won numerous awards and have aired on PBS. Arthur received Bachelors and Masters Degrees in English from the University of California, Los Angeles. 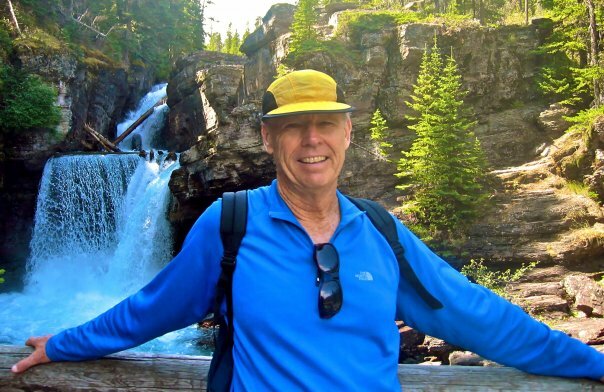 He taught English, coached tennis, and served as an administrator in independent schools. He currently volunteers as a naturalist in the Santa Monica Mountains National Recreation Area, leading interpretive walks on Chumash Indian culture. He lives in Pacific Palisades, California. 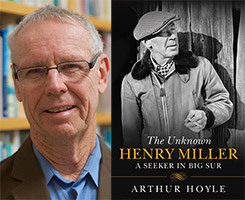 Arthur Hoyle’s biography of Henry Miller, The Unknown Henry Miller: A Seeker in Big Sur, was published in March 2014 by Skyhorse/​Arcade, which I listened to and reviewed in July of this year at Chiang Mai City News (Click here to read review). Arthur’s biography of Henry Miller is the subject of this interview today. KC: Curiosity was one of Henry Miller’s strengths. I am curious about how your decision to do a comprehensive biography of Henry Miller came about? A biography is an enormous undertaking, particularly when researching someone who has at least three existing biographies, as is the case with Miller. You promise the reader in your title an unknown Henry Miller. What were your objectives as you began your research and why did you choose Henry Miller as your subject? AH: I had been reading Miller since the mid 1990s. Discovered him by chance, browsing in a book store. Though I did graduate work at UCLA in English, I had never been assigned to read Miller. I read most of his books, and the three biographies. I came to the conclusion that he had not been fully understood by his previous biographers. I also felt that critical perceptions of him placed too much emphasis on his sexual content, and not enough on his spiritual content, and many critics failed to see the connection between his interest in sexuality and his spiritual quest. For all of these reasons, I felt he was “unknown” and I decided to make him more visible through my biography. I also discovered through the research that there were two Millers: the fictional Miller of the Tropics and The Rosy Crucifixion, and the Miller who is revealed in his correspondence. KC: Let’s expand on Miller’s spiritual side. Particularly God and his interest in Astrology. Did you find a clear picture of Henry’s belief in God during your research or was he conflicted on the subject? Is it possible to define Henry’s God? What do you feel was appealing about Astrology to Henry? I came away after listening to The Unknown Henry Miller surprised at how much he depended on it at times. Finally, how would you summarize Henry’s spiritual side? AH: Miller did believe in the existence of God, but not the God of any organized religion. He was on a mystical quest to experience union with the cosmos, and this is why he was interested in astrology and other occult traditions. Astrology is a system that links the inner self to the universe; it is a metaphorical language. But Miller did turn to it for guidance, in spite of his disclaimers to the contrary. Miller believed that God was accessible to all human beings and could be reached through individual effort, work on the self. Part of this work was disengaging from the norms and conventions of society in order to become detached. He was influenced by Zen Buddhism and the Taoist philosophy. Also by the American transcendentalists. KC: A lot of focus on Miller’s life has been given to June, his second wife, and Anais Nin. Rightfully so. They are more about the known Henry Miller and the Paris years. I’d like to focus on a less discussed woman: Janina Lepska, Miller’s third wife and the mother of two of Henry’s three children. What did you learn about Henry’s Big Sur years concerning Miller’s family life that you were unaware of going in? AH: I knew nothing about Lepska before I began work on the book. The first thing I did was interview her. At the time of the interview, which extended over a period of six months at her home in Santa Barbara, she was 84 years old and still very alert, with a strong memory. It was clear that she had been unhappy with Miller and deeply regretted her decision to leave her academic fellowship at Yale to come to Big Sur as his wife. Miller was a selfish husband who expected his wives to mother him, and showed little interest in their needs. His unsuccessful marriages could all be traced to his dysfunctional relationship with his own mother. Nin saw this aspect of Miller very clearly, which is why she eventually broke with him. KC: Another important person in Henry’s life was Barney Rosset, the publisher of Grove Press and The Evergreen Review. Can you talk about Barney’s persistence in pursuing Henry’s work for publication in the USA? Henry came across as ambivalent, at best, about making legal challenges. Can you explain the differences between Miller’s thinking and Rosset’s? AH: Rosset had been pursuing Miller for the rights to Tropic of Cancer since the late 1950s. Miller was not interested in bringing his banned books out in the US at that time. He didn’t want the controversy, and he didn’t need the money. He also feared that people would read the banned books for the wrong reasons—sensationalistic reasons. He changed his mind because of his relationship with Renate Gerhardt. He needed money if he was going to set up a new life with her in Europe. As it turned out, he was correct in his expectations for America’s reception of the banned books. And his relationship with Renate fizzled out. The publication of the banned books made him a celebrity, a role he had mixed feelings about. The flood of money that came in also caused him problems he would rather not have had. 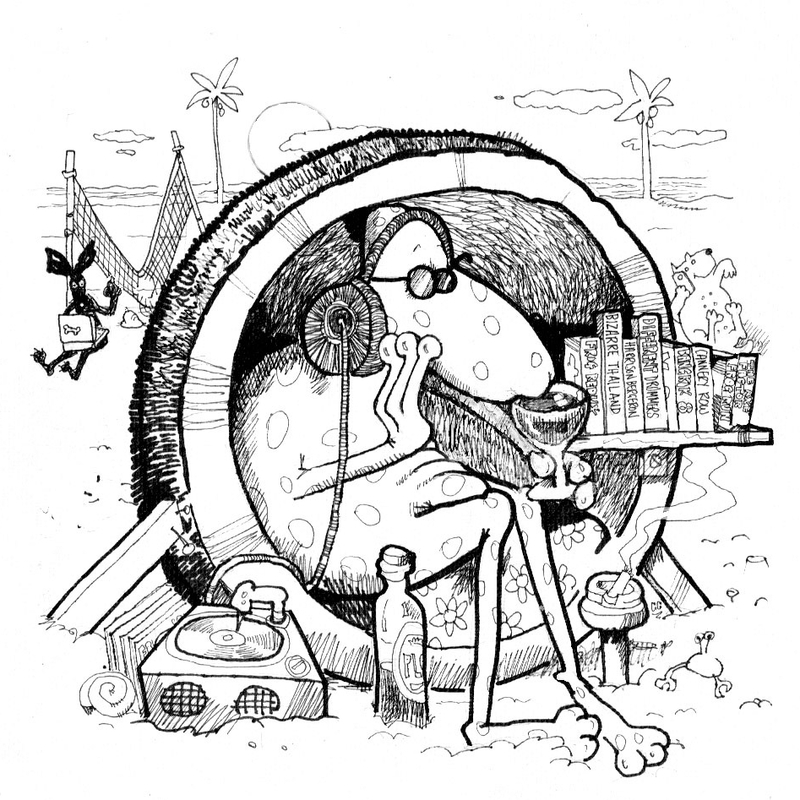 KC: Miller’s writing style was unique at the time. Henry Miller blurred the line between fact and fiction, often. He could embellish facts or omit them completely in his novels. I found the research you did regarding Henry’s correspondence one of the most interesting aspects of your biography. What stands out among the volumes of letters Henry wrote during his lifetime? What did he reveal in his letters or conversely what did he hide about himself in his books? AH: Miller wrote expressionistically in his autobiographical novels. It was his way of reaching the truth, a truth found only in art. There is no way to know how much of Miller’s fiction is “factual” or “representational” and how much is embellishment. He was writing from his own experience, but using language to transform that experience and, in the process, to transform himself. What you see in the correspondence that you do not see in the novels is Miller’s insecurity and vulnerability about his mission as a writer. He was trying to perform a magical act with his writing, and in his correspondence, especially to Durrell, you see him wondering if he is not deceiving both himself and his readers. KC: Can you talk about Henry’s relationship with books? As you note, one of his more accessible publications is The Books in My Life. What did you learn about the importance of reading versus the importance of life experience according to Miller? AH: For Miller, everything was life experience, including the reading of books. Miller believed that through certain books he could absorb the life experiences of great men whom he admired, men he called “exemplars.” His literary heroes were Dostoevsky and Whitman, writers who he believed had brought the fulness of life into their books. Miller’s experiences as a reader shaped him as a writer and as a man, which is why he wrote The BOOKS in My LIFE. The two are really inseparable. But for Miller, only certain types of books were worth reading, and each person had to discover what they were—the books that would illuminate the reader’s life. KC: Lets move to Miller’s Southern California years. A territory you know well. What year did he move south from Big Sur? These were Henry’s full blown celebrity years. Henry seemed to enjoy some, but not all, aspects of being a celebrity artist. Tell me about that time for Henry? Was it a period of contentment or discontent? And please work in the subject of his water colors, if you can. AH: Miller moved permanently to Pacific Palisades in 1961, though he kept his house in Big Sur. On the advice of his accountant, he bought a house in an upscale neighborhood known locally as The Huntington. For a time, Lepska, divorced from her second husband, moved in with him along with Tony and Val. It was a mixed time for Miller. His health was deteriorating, he was not in a romantic relationship of any significance (though he did make a foolish marriage to a young Japanese woman who took advantage of him), and he was pretty much played out as a writer. He hobnobbed with celebrities, was lionized by the media, and became somewhat of an oracle for the countercultural upheavals going on all across American society. He was painting a lot of watercolors during the 1960s, but he sometimes felt like a drudge doing it because the paintings were being used to obtain tax write-offs. He went into serious physical decline in the 1970s, but remained a spirited presence until his death in 1980, in part due to his passionate attachment to the beautiful Brenda Venus. KC: Your biography shows that Henry Miller was a seeker and on a journey of discovery. Miller also showed ample disdain for the USA periodically. What, specifically, did Henry Miller discover about himself or the world that you haven’t already mentioned above and what in particular did Henry find so unappealing about his birth country and the American people in general? AH: Miller reacted against two influences: his mother’s bourgeois conventionality, that he associated with her humorlessness and joylessness; and the materialism and consumerism of mainstream American life. It is important to remember that Miller was born in Brooklyn at the height of the Gilded Age, and he matured during World War One and the Roaring Twenties. Given the literary influences on him mentioned above, he was moving in a personal direction that was opposed to the direction of American life. He saw spiritual desolation in the American scene, and he expressed this most directly in his book The Air-Conditioned Nightmare. But there are also abundant passages in the Tropics and The Rosy Crucifixion that express his dismay with the values most Americans choose to live by. He opted out, first by going to Europe, then by secluding himself in Big Sur. KC: What is next for Arthur Hoyle? If you could choose only one writer, living or dead, to research for another biography, who would it be and why? AH: I think if I were to write another literary biography, I would do it on the English writer John Berger, a fascinating man, and a brilliant one. I am writing a non-fiction book now, portraits of American men and women who, like Miller, have made significant but overlooked or under appreciated contributions to our culture. KC: Thank-you, Arthur. 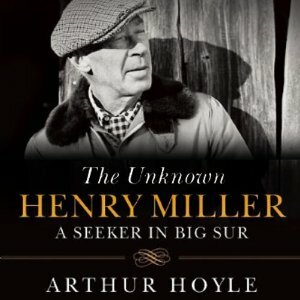 I very much enjoyed listening to The Unknown Henry Miller: A Seeker in Big Sur. It helped fill in a lot of the blanks about his life for me. Your next book sounds equally interesting. I look forward to that publication. Thanks again for taking the time to talk about an often misunderstood and under-appreciated writer. Excellent interview full of epiphanies. Must read this book posthaste. Thanks, Jim. Henry Miller was an interesting man. A good “exemplar” for many.